There was a birthday party in Werner Recital Hall at the University of Cincinnati College-Conservatory of Music Tuesday night. The honoree was Miguel Roig-Francoli, professor of music theory and composition at CCM, whose 60th birthday was “celebrated” with a program of his chamber music performed by CCM colleagues, friends and his wife, violinist Jennifer Roig-Francoli. 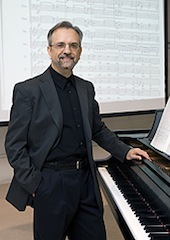 The music spanned Roig-Francoli’s compositional career, from his Suite Apócrifa for piano, an early work, composed in his native Spain in 1978-79, to his song cycle “Cinco Canciones con los Ojos Cerrados” (“Five Songs with Closed Eyes”) for soprano and piano, premiered at CCM in January. There is a gap in Roig-Francoli’s output from 1987 to 2003, when he concentrated on academic research and teaching (he is the author of many scholarly articles and two textbooks). His return to composition was prompted by his reaction to the Iraq War, he says, and since then his music has focused largely on spiritual themes. One of them, “Songs of the Infinite” for violin and piano (2010), received its Cincinnati premiere on Tuesday’s concert, performed by his wife, to whom it is dedicated. Roig-Francoli writes in a postmodern, neo-tonal style. Each work on the program was directly appealing and was marked by superb craftsmanship and vibrant color. Cellist Ilya Finkelshteyn and pianist James Tocco opened with his 1984 Sonata for Violoncello and Piano. The work’s outer Allegros, one marked energico, the other furioso, enclose a deliberate slow movement. It was an exhilarating ride for the players and their listeners, coming to a pealing end at the conclusion of the final, propulsive Allegro. Jennifer Roig-Francoli – who in addition to performing both baroque and modern violin, teaches the Alexander Technique at CCM and Xavier University – performed “Songs of the Infinite.” Her warm bright tone filled the hall, with pianist Edward Neeman, a CCM alumnus and former student of Tocco, providing a superb accompaniment. The work has five movements with evocative titles. After a serious introduction and close, dense chords by Neeman, “The Question” opened into an expansive dialogue between the two instruments. “Melody” was flowing and sweet. “Play of Sparkles” indeed sparkled, coming to a complete stop before continuing to an abrupt end. “Improvisation” focused on the violin, with Bachian counterpoint and a soft, high ending. Most striking of all, perhaps, was the final movement, “The Source.” It began with bestial-sounding figures low on the piano and sharp strokes by the violin, building to a rapid pace and accumulating considerable drama. Soprano/CCM alumna Abigail Santos Villalobos was soloist with Michael Chertock at the keyboard in “Cinco Canciones” following intermission. A setting of poetry by contemporary Spanish poet Antonio Colinas, it was deeply moving, its verses couched in music of affecting beauty, enhanced by Santos’ satiny voice. “There is no more light in the world. All light is within us” waxed melodic, while “If this year that has just begin, I do not return to you” went from cascading figures in voice and piano to a slow, somber end. There were many rests during the first stanza of “This silence remains in order to forget silences,” giving it a programmatic effect. “I thought I was gone, but no, I was here” began upbeat with a downturn at the end. “Farewell, word, farewell” was full of drama, with halting figures in the piano. Chertock invested every ounce of color in Suite Apócrifa, a suite of eight movements ranging from mysterious (“Misterioso”) to energetic (“Ritmo y energico,” which came to a thunderous end), dreamy (“Muy intimo y lento”) and flowing (“Continuo”). Stylistically, the music varied from atonal and angular to neo-impressionistic, coming to an end with “Continuo” on four big chords. The final work, “Songs of Light and Darkness” for piano trio, also received its Cincinnati premiere. The composer describes it as “a musical reflection on light and darkness, both in the inner and outer worlds.” Lees, Tocco and Finkelshteyn gave it a superlative performance. “Dark Night of the Soul,” which began with descending figures in all three voices before giving way to vigorous dotted rhythms, ended on a simple major triad. Ensemble was impeccable in “Mountaintop Light,” which opened with leaping, unison figures before relaxing into melody and incomplete passages followed by rests. “Light on a Calm Sea” breathed serenity, while “Dark Clouds, Sunrays Sparkling on Water” was turbulent before coming to a full stop and continuing in a dance-like manner. The program will be repeated in Weill Hall at New York’s Carnegie Hall on November 17.